Join the discussion on our forums! 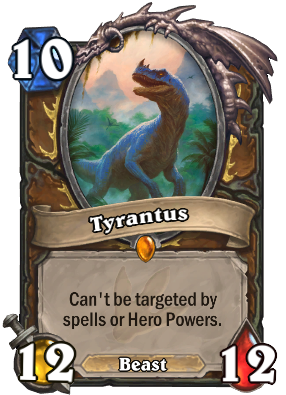 Come discuss Tyrantus over in our dedicated Tyrantus discussion topic. PUT YOUR FAITH IN THE LIGHT!!! Medivh, the Guardian , anyone? This guy has a 4/4 pocket on turn 7 everytime. Crafted this guy for my quest druid deck. Gonna try it with the witching hour. "This card is mage's worst nightmare!" Opened a gold one as my first un'goro legendary. Tried him in quest druid for a while back then but sadly since he has the veil over his art due to the untargetableness you can't see much of the animation. Ended up dusting him because he's just not good enough, but I had some fun moments in quest/ramp! I got this from Jeweled Macaw and played it with Tundra Rhino on the board. The other guy didn't know what hit him, hehe. This card was hard to use before because it's not a game ender on it's own, rather a big beatstick, but now that Shadowreaper Anduin exists, which can remove it without targeting this card will never see competitive play. Rest in Peace. If your against a priest you can just hold it until he uses Shadowreaper Anduin. I love this card. Nothing like playing Kun and Tyrantus on turn 10 against Priests and Mages and then see how they drag the red arrow to Tyrantus just to realise they cant target him and then remove Kun. Got a gold one from pack and don't have quest, dust it for 1600? This card is pretty good in ramp druid. Mage's worst nightmare!